Seeing the deplorable state humans were living in, the sun god Inti decided to create a couple and send them to Earth to create a civilization. 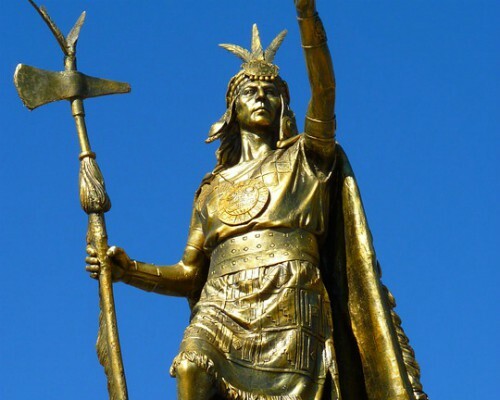 They appeared out from the foamy waters of the Titicaca, walking above the waters to the Isla del Sol (island of the sun), in the midst of the lake, with a golden rod in their hands that would show them the place where the new civilization would begin. The couple went to a site called Huanacauri, where the golden rod was planted into the soil and disappeared; thus telling them this was the ideal place. Then the man, Manco Capac, began to teach men agricultural and animal husbandry skills, while his sister and wife, Mama Ocllo, instructed women in housekeeping and child-rearing. The Incan emperors claimed they descend from this couple, and therefore, from the sun god himself.